Not long ago, I read about how much Swedish tracing paper can help the garment construction process. After using it the first time, I am a total convert. Swedish tracing paper has helped my sewing tremendously. Swedish tracing paper is similar to a nonwoven sew-in interfacing that you can easily write on. It is used to copy your pattern pieces. Why would you want to do that? There are lots of great reasons. ❦ You can reuse the pattern no matter what you did to it the first time. 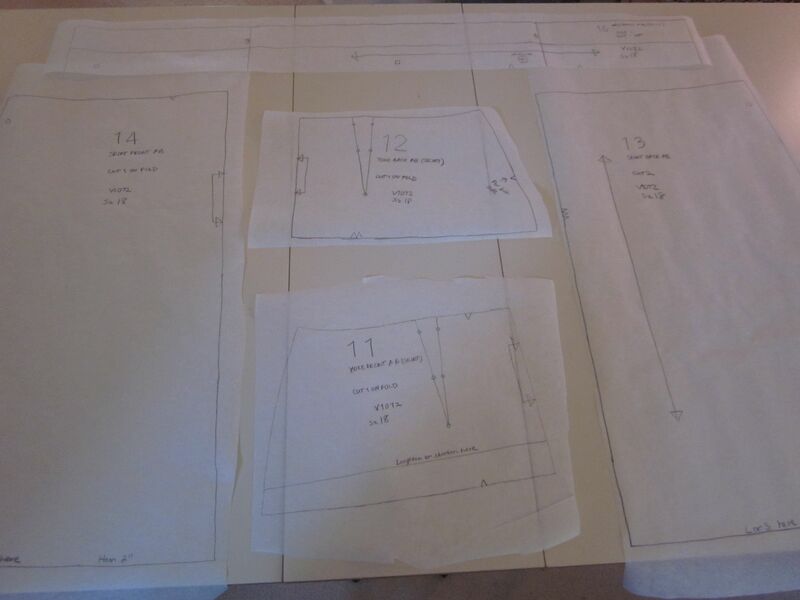 On a dress I did a couple of years ago, I cut out the size that corresponded to my measurements. It was too small. Thank goodness it was a current pattern, because I had to trudge back to the fabric store to buy it again. If I had cut out copies of the pattern pieces, I could have gone to the tissue paper and retrace the bigger size. (It was a multi-size pattern.) If you make the short version of a skirt, you can still go back and make the long version if you want. Tracing the pattern keeps the original paper pattern intact. ❦ All the sizes remain available to use on a multi-size pattern. If your dimensions change, or you want to use the pattern for a friend, you can reuse the pattern. Again, the original paper pattern remains intact. ❦ You can make extra copies of pattern pieces that need to be placed more than once on the pattern layout. You can make a full pattern piece if only half is given because it was supposed to be cut on a fold, but you can’t or don’t want to cut it that way. ❦ Swedish tracing paper is a much better medium for making pattern alterations than tissue paper. You can cut it up, tape it back together, and pull it back apart. You can pin one piece to another. It’s also somewhat drapable, so you can pin-fit certain elements to see if they’re fitting at least somewhat like they should be even before you do a muslin. Some people use it to skip the muslin step altogether. ❦ You are free to experiment with changes with no fear of irrevocably ruining the pattern. I sometimes over think my alterations and make them more complicated than they need to be. On a recent dress, it took three tries to get the bodice to fit correctly in muslin. I had to retrace the bodice pieces twice. Thank goodness the original pattern piece was still intact. I have always been so leery of cutting up a pattern to try something different. Now I feel free to cut up the traced pattern pieces as much as I want. I can change a neckline shape, a collar shape, a sleeve length without fear. Now I can really design on my own because every mistake in pattern alteration can be undone. To use Swedish tracing paper, I cut out and iron my paper pieces as usual, then I put the original pattern piece under the tracing paper and trace it with a pencil. A somewhat dull pencil gives a very nice line. Be sure to trace all the symbols and information on the paper pattern piece. The whole process doesn’t take very much time at all. The Swedish tracing paper is more weighty than the tissue paper so it lays nicely on the fabric. I test my pattern in muslin to check for changes I need to make to the fit or design elements, than make those changes to the new pattern piece. Swedish tracing paper comes in 10-yard rolls that are 29 inches wide. A number of online retailers carry it. I happen to get mine from seller Jan-Marie on eBay ($12.95 with free shipping).